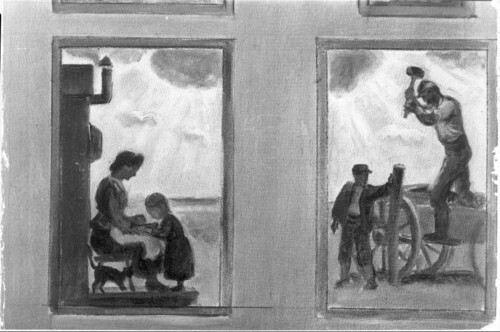 This black and white photograph shows the preliminary sketches by Regionalist artist John Steuart Curry, (1897-1946), for the rotunda at the statehouse in Topeka, Kansas. The sketches are a reflection of the homestead and the building of barb wire fences. These panels were to be commissioned into murals for the second chapter in the state's history. However, the proposals never became a reality because of the controversy surrounding Curry's earlier projects "Tragic Prelude" and the "Kansas Pastoral" which illustrated the first and third chapters in the state's history on the second-floor of the capitol.